What's the Rush, Frau Merkel? It lacks a political logic, a moral stand, and is clearly exposed with cynicism at a time Turkey, with all its reformist forces and civilian dissent severely under oppression, adrift towards an autocratic rule - its future filled with horrifying uncertainties. Her visit displays a sharp diversion from Berlin's committment to European 'values' and much relied-upon benevolence for all the remnant dynamics in Turkey for keeping the democratic order alive. It is doomed to send the wrong message worldwide. No matter what her intentions are, no matter how well the choreography of her visit will be, this visit seems untimely, because of the fact that it will be perceived in opposite terms by her hosts and the opponents of it. As the past experiences with the ruling AKP have shown us, Merkel's untimely move will be presented as a strong support for the oppressive policies President Erdoğan is identified with, and alienate Germany in the minds of whatever remained of the independent media, the opposition, Kurds and Alevis, concerned conservatives, morally pious, leftists, seculars and liberals- all those who now in strongest terms disagree with what they see as the nightmarish direction President Erdoğan is taking the country with him. Is Chancellor Merkel fully aware of what sort of shape Turkey these days are in, and how acute its outcry for democracy has become? Even the inability to socially unite against terror and carnage in Ankara, and the widespread schadenfreude about the victims across the country, is enough to see that Turkey, sadly, has been mismanaged to a self-destructive polarisation, by a globally isolated mentality, whose pragmatism, benefitting from any negotiations these days, may add to the ordeal, and serve for further oppression. "Erdoğan does not want to solve the refugee crisis. He is instrumentalizing the issue to stay in power and uses the refugees to put pressure on Europe." The chancellor is to visit a country whose institutions Its institutions are being deprived of their democratically existential, constitutional duties. In most of the public sector and even the private one, key positions have been given to people whose merits are judged only by their loyalty to the president and the ruling party rather than professional skills. Developments make it clear that the backbone of the judiciary has been seized by the executive powers and it has now been acting as an extension of it. The belief that most of the political crimes and killings due to domestic political tension will be brought to court and accountability for those responsible will be given has vanished; it is now being replaced by anger and a sociology of outrage that has slowly turned public squares and streets into places of violent confrontations. Parliament has been, since the June 7 poll, prevented from functioning, kept closed most of the time even when it was needed urgently to convene, due to tactical maneuvering by the same executive. The separation of powers has almost melted down, raising fears that the destination of a "party state" is now at the horizon. The media is now standing on its last leg, with very bleak prospects to report the facts, convey diversity of opinions. 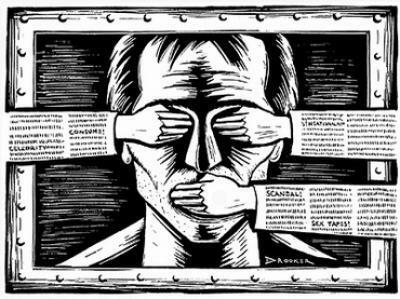 The censorship measures taken against the TV, along with the state broadcaster TRT now a full-scale AKP mouthpiece, leaves almost no room for the opposition to reach out the voters. Media's weakened independent backbone is being broken by legal investigations into media outlets and journalists, 'berufsverbot' style sackings of decent colleagues, prison sentences for "insulting the president" delivered, colleagues sent to jail for expressing critical views; kept behind bars for moths without an indictment. 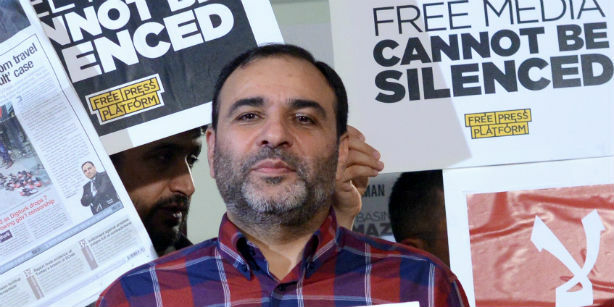 Althugh he was released three days later, the incident is as worrisome as it is significant in signalling that the further suffocative measures towards journalists will remain as Damocles's Sword, for intimidation. More and more journalists are in line for the same destination, with the burden of legal inquiries and prison sentences on their shoulders. Also the recent full-scale 'publicity ban' on Ankara bombing shows how hostile to free reporting the AKP has become. "Speaking out has become difficult for journalists over there [in Turkey]. You can even be arrested for a tweet against the president, like what happened to the editor of Today's Zaman, Bülent Keneş." Given also the full-scale demonisation of the pro-Kurdish HDP, and the violence threatening the safety and fairness of the elections in November 1, it becomes indeed questionable why Merkel chooses to rush to the scene with the issue of refugees, official talks about which, at this very time, will not be a win-win for Germany, and the Turkish civil society which is now in a 'to be or not to be' type of last battle in an election poisoned by sheer polarisation.